Chuck Hagel has been fired by Obama from his position as Defense Secretary. Hagel, a former GOP Senator, was appointed by Obama in early 2013 and therefore was scheduled to serve for the entirety of Obama’s second term. Prior to his appointment, Hagel is said to have visited the White House in 2009, and personally warned Obama that he should look out for rogue elements within the Pentagon that were leading a ‘new world order’. This was not reported on some internet conspiracy forum, it was a leading report published shortly before Hagel’s appointment, by Bob Woodward, an award winning journalist and associate editor with The Washington Post. “We don’t control it. You must question everything, every assumption, everything they” — the military and diplomats — “tell you. Any assumption 10 years old is out of date. You need to question our role. You need to question the military. You need to question what are we using the military for.” Hagel is said to have told the President. The Post report also stated that Hagel warned Obama about becoming “bogged down” in the ongoing war in Afghanistan, saying it would define Obama’s first term. Hagel reportedly later privately questioned the wisdom of sending additional troops to join the conflict. “If Hagel is confirmed, as appears likely, he and the president will have a large task in navigating this new world order.” The Post report concluded at the time. It remains to be discovered as to whether or not Hagel attempted to oust the rogue elements within the military industrial complex. The last straw for Hagel, though, may have been comments he made last week during a sit down interview with Charlie Rose at the Pentagon. During the exchange, Hagel expressed a belief that US military action against ISIS was “indirectly benefiting” the Syrian President Bashar Assad, comments that were sure to have been unwelcome by the powers that be, given its push for airstrikes against the Syrian government last year. 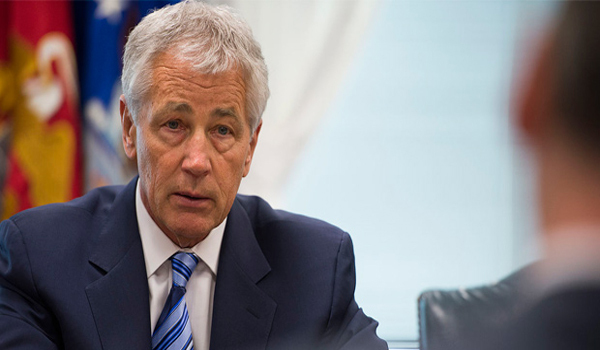 Hagel also said that “The world is damn dangerous,” adding that the US military is unprepared. In short, Hagel is no longer in a job because he alluded to rogue globalist elements within the US military, criticized the long imperial march to war, and admitted to detrimental blowback in the ‘war on terror’. Yeah, that’ll do it. check mate USA. The Zionists Won! His comments about rogue elements in the Pentagon should be given credence as the President has dismissed numerous Pentagon officials during th last two years. What is was warning about was the take over of key portions of the Department of Defense and State by rogue, treasonous Zionists. Lead and controlled by dual citizen Israeli moles spread far and wide throughout the entire Federal Government. These are the same enemy that first Eisenhower and later Kennedy warned the American people about. The entire US Military and State Department, the Fed etc. has become completely Israel centric. The entire focus of the US governmentr since Israeli’s attack against America on 9-11 has been supporting Israel and its imperial and strategic ambitions. Good grief I fear it is now to late. We are soon to be left with a hollowed out shell of a republic. Gutted from end to end by the Zionists.